The weighing hand pallet truck model Xtra-B combines the controlling function of a very accurate weighing system with the mobility and the flexible availability of a hand pallet truck. 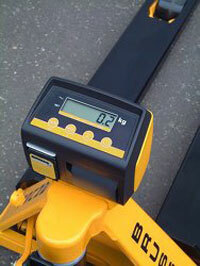 With the Bruss Xtra-B you weigh pallets and containers during transport, at the place of handling. You save time when checking incoming and outgoing goods and during dosing and filling processes. 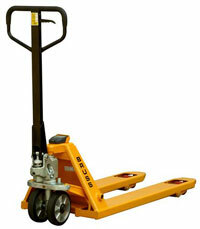 The weighing pallet truck Xtra-B is developed for industrial applications and is protected against water, dust and shocks. The exchangeable battery module provides for 35 hours of use.